We were lucky that our free trailer was small --- 10 feet wide by 50 feet long. Because when we got the trailer-hauling guys to come look at our property, they said a larger trailer would have been impossible to move in. Even for our tiny trailer, we had to cut big openings in the forest at each curve in the driveway to give the trailer room to maneuver around. And we had to wait and wait and wait until the driest day of the year when a bulldozer wouldn't get stuck in our floodplain. My father was never keen on the idea of me living in a trailer, and though I have happily ignored that piece of advice, I wish I'd taken his advice to absent myself from the farm on moving day. At a rate of hundreds of dollars per hour, I could see my small stash of backup cash slipping away with every hangup. I watched our crew jack the trailer up so that it could roll across the creek, my heart in my throat, and I gulped as a low-hanging branch ripped a hole in the tin wall. 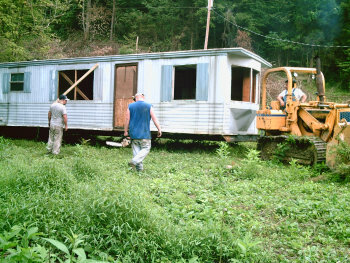 But, finally, the bulldozer yanked our new/old trailer into the spot we'd mowed for it between the blackberry brambles. Home!